In 1867 Paris held the equivalent of a World's Fair. 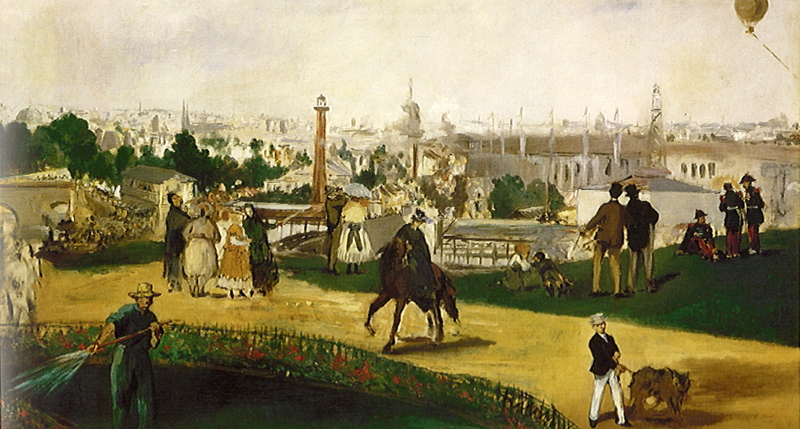 It was known as The Universal Exhibition and created such excitement that Manet was inspired to create a lasting view of the event. Or did he? Once again, initial expectations are mistaken and, as always, it is worth keeping in mind the criticisms of the painting by both his contemporaries and modern scholars. 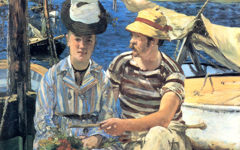 The most common complaint is that Manet has merged the background with the foreground thereby making it look as though the Seine has disappeared. In reality, it runs between the Trocadero and the distant view. 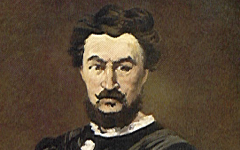 Another critical comment is that Manet has "flattened" the background to concentrate the viewer's attention on painting's essential characteristics. As you will see, the observation is correct but not the conclusion. Manet's painting puns on the art world's understanding of Exhibition. The foreground figures are in a "gallery" or "studio" admiring the painting by Manet in the background (left). It looks flat because paintings are flat. And, no doubt, Manet dreamt of a Universal Exhibition for his paintings in any event; it signals the appearance of a great master. As in other works by Manet, the subject of his imaginary painting has fused with the studio space.1 That is why the Seine has disappeared; it was not in "his painting" to begin with. Manet had painted a similar but simpler composition two years earlier. The horsewoman at left turns away from her "canvas" in a pose characteristic of an artist. She holds her whip as a "paintbrush" and the background is her "painting". Yet even though the background looks unfinished, Manet signed the canvas. Why? 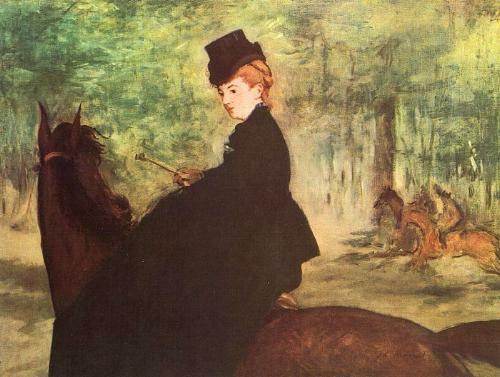 Manet's "painting" may be finished but the rider's is not. It is in the process of creation. 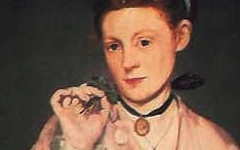 In a further twist the rider shares Manet's red hair, a symbol of the androgyny of Manet's mind. There is more to the Tragic Actor than meets the eye. Find out what's there that others cannot see. Manet's model uses flowers to paint this painting. Original Publication Date on EPPH: 18 Jan 2011. © Simon Abrahams. Articles on this site are the copyright of Simon Abrahams. To use copyrighted material in print or other media for purposes beyond 'fair use', you must obtain permission from the copyright owner. Websites may link to this page without permission (please do) but may not reproduce the material on their own site without crediting Simon Abrahams and EPPH.